I love dogs. Any breed, any dog. They're great. So when PetMAC marketplace and adoption center moved from its Arlington location to Lake Anne Plaza, I was thrilled! This small, woman-owned business proves that doing good and doing good business go hand in hand. Owner Cindy Williams opened PetMAC in 2005 in partnership with Homeward Trails Animal Rescue (a wonderful organization). Before that, she had an on-line business selling all-natural pet foods and supplies. PetMAC was a logical next step--combining her business skills with her passion for working with animal rescue organizations. She says merging the two loves is "a wonderful opportunity to make a difference in pets' lives - to be able to offer healthy foods and educate new pet owners on the importance of a good quality, species appropriate diet. We have the greatest customers who are so friendly and appreciative of the work we do - and the people are pretty cool too!" PetMAC is a one-stop shop for everything your dog or cat needs to be healthy and happy. They specialize in offering all-natural foods with no chemical preservatives and no animal by-products. They stock not only traditional kibble and canned diets for your pet, but freeze-dried, dehydrated and frozen raw diets as well. If you've ever had a pet with allergies, you know how important a good diet it is! 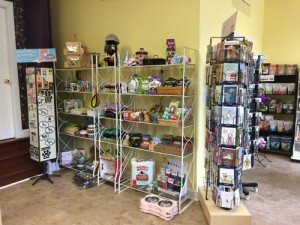 They also carry all kinds of toys, including ones that can hold up to the strongest jaws, stylish and durable collars and leashes, comfy cozy beds, behavioral modification products, fragrant shampoos and grooming supplies, doggy apparel including raincoats, winter coats and seasonal clothing such as Halloween costumes and Santa suits. Cindy and her crew are doing a lot of great work out of their small space at Lake Anne. In addition to selling products, they host adoption events and provide all sorts of fun classes for pet owners. They are truly a wonderful resource for dog and cat lovers. But there is more. Cindy believes in supporting other American and local businesses by offering a large variety of USA and locally-made foods and supplies. Arlington's Max and Ruffies vegetarian dog treats, USA-made Bixbi Chicken, Lamb and Pork jerky, Wisconsin-based and family-owned Fromm dog and cat food, Florida's hand-made cat toys from Mouse Factory and California-made durable Goughnuts dog toys are just a few of the USA made products they sell. And if you don't have a pet to buy all these wonderful things for? No worries. Cindy and her team work closely with local rescue groups to adopt dogs and cats out from the shop. Soon they will have resident adoptable kitties who love visitors (if you just need a feline fix, stop in for some love)--they just need to build an enclosure so the rascals don't escape the shop. They donate a portion of their sales to their partner rescue groups each quarter, donate to rescue fundraisers, and offer discounted supplies to their partner rescue groups and fosters as their way of saying "thank you" for helping rescue shelter animals. 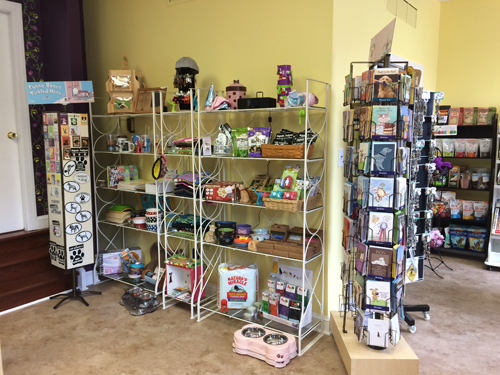 If you want to support a local business, and you're looking for a shop that really cares about helping you do what's best for your pet, then PetMAC is the shop for you! We hope to see you soon! Visit them at 11412 Washington Plaza West, Reston, VA 20190.